To keep a boat in good condition (especially if it's sailed in salt water) requires a lot of work. To Steve, I have a second mast (comp tip) that was given to me by John (on this thread) that I haven't used yet because I prefer the solid aluminum mast when flying the spi. Thanks again John! Maybe I'll see you this week-end if you're at the regatta !!! All the boats on this thread are marvelous and all of their owners are to be commended for their appearance..
ALL of these boats are super-nice, but I noticed they're also just sitting on the beach, let's see them in action! Flying a hull, flipping over or just cruisin'. I'm taking mine out Friday, don't expect a lot of wind though, but will be posting a picture later that night. 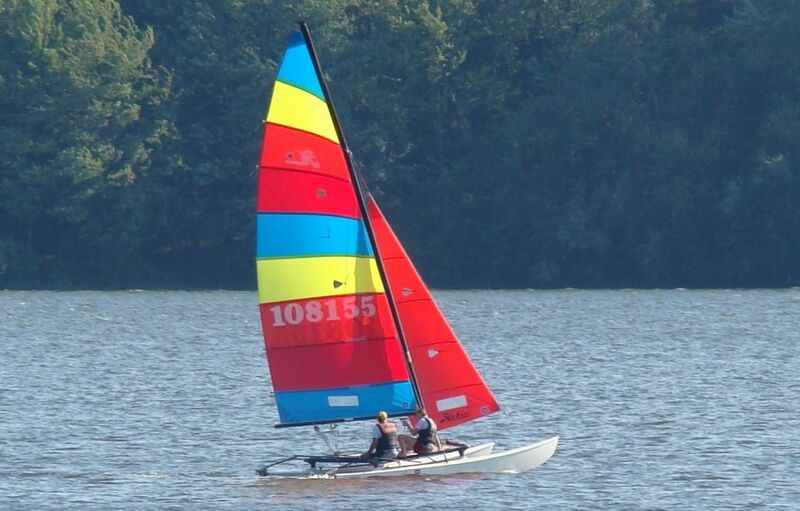 Congrats on all of your Hobie's, keep them pic's coming, happy sailing! This is all I've got . . . .
Boring video . . .
DavidBell47 - love the boat. Very cool. I have a couple of questions about the rigging. 1) I noticed something unique on your trapeze system, that they are held away from the sidebar by blocks, one attached to the hull and one to the stay adjuster. Did you drill through the lip on the hull? Was this a kit or a DIY? Looks great. I have a dual trapeze system, but the bungee wraps around the sidebar and its annoying when you're sitting on the tramp. I guess this system gives you ample room for lateral movement fore and aft? 2) At the rear, noticed a strap attached to the lip of the hull. I presume that's for hiking out? It also looks handy for moving the boat around on the beach or trailer. 3) THE SPINNAKER!! I have a spinnaker kit that has been sitting in a box for a month now, I haven't had the time or patience to begin the installation process. Did you install it or have it done? 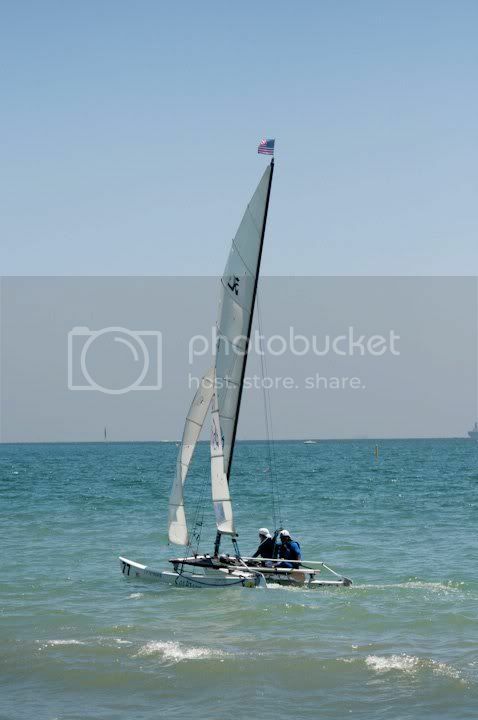 Is this the Hobie kit from Europe? My instructions arrived in French, sacre bleu! I would greatly appreciate a chance to talk with you about the kit and the spin's operation on the water. 4) Side rails - is that marine carpet or the non-slip rubber? Any thoughts on the benefit of one over the other? Any problems with adhesion, peeling? very nice photo! I really like your sails, too. In referrence to question #1, below are pics that give a better view of the system. It's over-kill I admit but it gives me total freedom while trapped out. The original system restricted my lateral movement plus, was beginning to wear on my rail-rug (Surefoot Eva Grip) from Murry's. 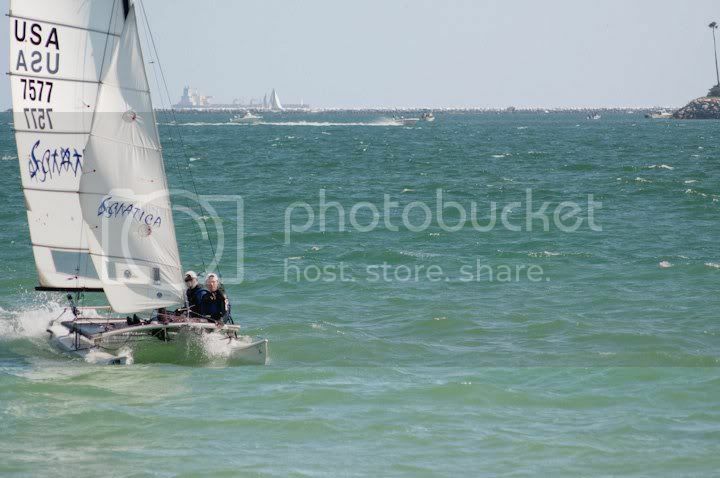 I sail solo most of the time and having that freedom aft makes a big difference. I also didn't want to replace my rail-rug every year. Haven't had to replace it at all since the first installation and it still looks good. All I've done here is lengthen the bungee (by allowing it to cris-cross across the beam of the boat through a series of micro-blocks). That keeps the trap line snug and allows me, or the crew, to go as far aft as we need to. Question #2 - Yep, those are foot straps. Used for anchoring to the stern of the boat while trapped or to aid in the boat's movement when on the beach. 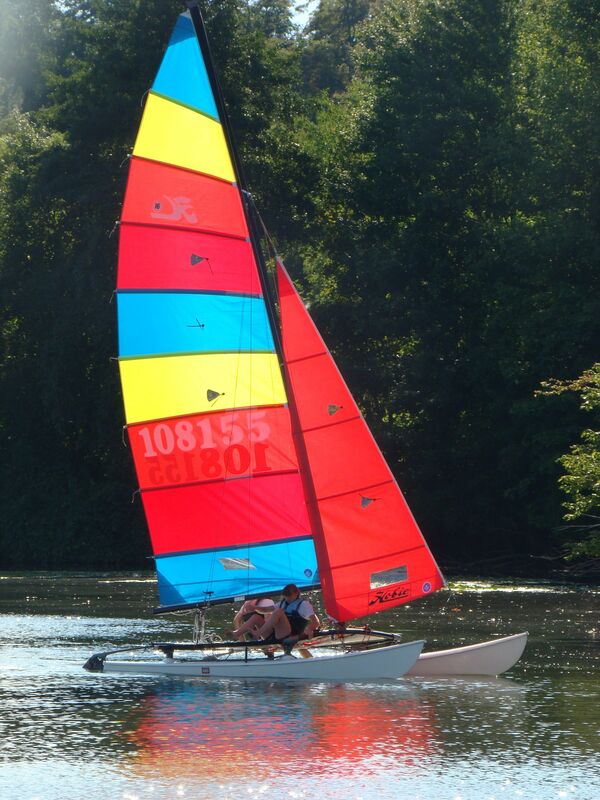 Question #3 - The spinnaker is the most fun thing I've done to my boat. Everything else was an an upgrade to something that already existed but this was a complete add-on !!! This is not the kit. A good friend of mine built the snuffer and I freelanced the rest. I studied all the plans and started hanging out with the F-18 skippers during the regattas. 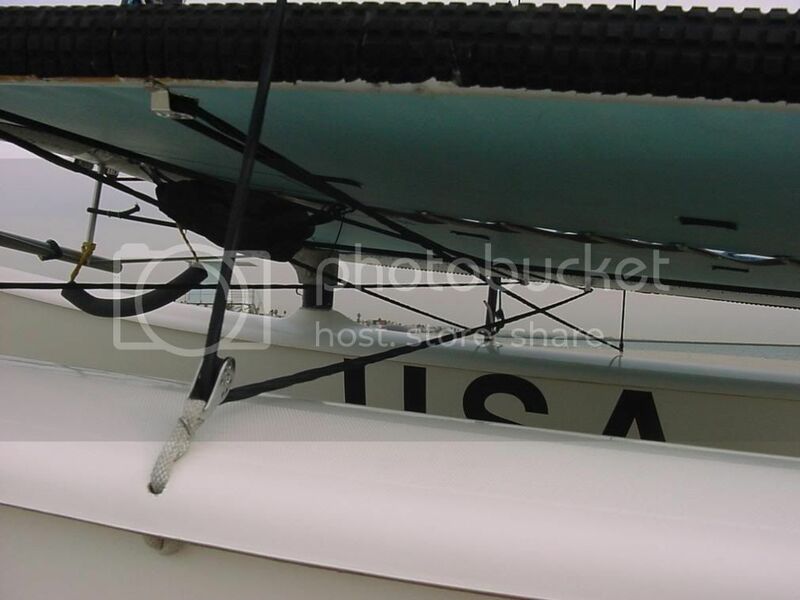 There are some unique concerns w/ the H16 to make sure that the jib travler sheet and the spi halyard don't inappropriately intersect. A lot of the diagrams I've found lack detail and some of them are down right inaccurate. Bought all the blocks and cleats from "West Marine" and I'm using a 5o5 spinnaker til I can find a Hobie Spi or at least the dimensions of one so I can have it made. Anything I can do to help you, just let be know. Question #4 - I think I answered this in Question #1. It's called Surefoot Eva Grip (30-2103) from Murrays. I can't compare it to anything else cause it's all I've used but all I can say is that I put it on about four years ago and it still looks the same. Of course, it doesn't have that bungee dragging across it either. here is from the maiden voyage only about 2 hours ago. everything went great can't wait to get back out there tomorrow. Sorry no hulls flying. I officially have about 6 hours of sailing experience so far but it will come. ugly stained sails will get replaced eventually but for now I'm happy to finally be sailing. 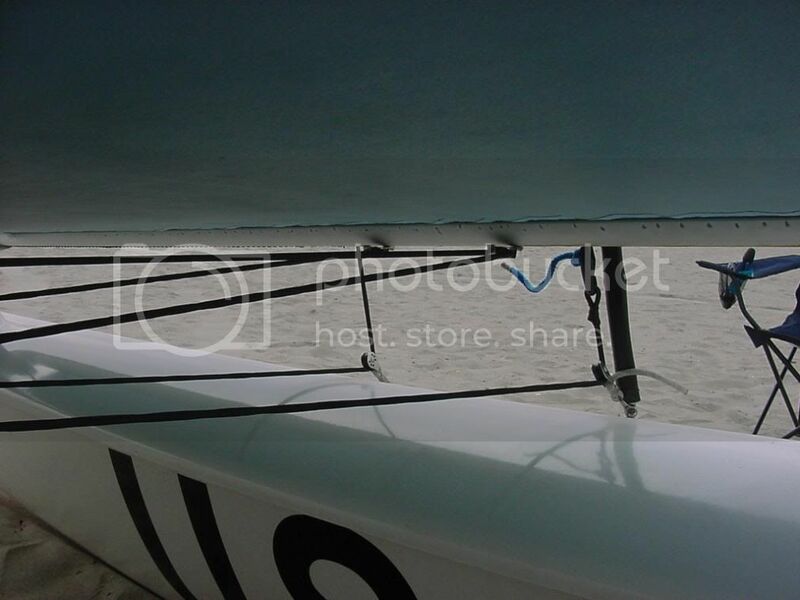 Nice, but you need to get your main fully hoisted and the halyard clipped in. The cleat on the mast is not designed to carry the load. It'll also give you more room underneath the boom. Yep I noticed that and was fixed shortly after those pics were taken. At this point every second is a learning experience. here is me and my boat. I haven't had my maiden voyage yet, but I hope to get out this weekend.